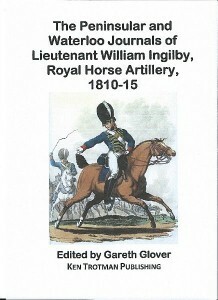 The journals of Lieutenant William Bates Ingilby have been known to me for quite some time, both his Peninsular Journal has been previously printed, and his Waterloo Journal separately some ninety years apart. Both reside at Leeds Archive, Reference WYL230/3596. Therefore with their kind permission, his entire set of Journals is published as one entity for the very first time. Ingilby was born on 30 April 1789 at North Deighton, the fourth child of the Reverend Henry Ingilby and Isabella Jane Bates and having attended the Royal Military academy, Woolwich he joined the Royal Artillery as a 2nd Lieutenant on 1 April 1809. In July 1810 aged 19 he was posted into Captain R Lawson’s Company (7 Company of 8 Battalion) then in Portugal. He served at the actions of Busaco, Miranda do Corvo, Foz dArouce, Sabugal, Fuentes d’Onoro, Ciudad Rodrigo, the Siege of the Salamanca forts, where he was wounded, (nearly losing his head), Salamanca, Burgos, Canizal, Llerena and Cabecon, before leaving the peninsula in January 1813, having gained promotion to 1st Lieutenant on 9 April 1812. He now joined G Troop Royal Horse Artillery under the command of one Captain Mercer and remained with this troop when called to Belgium in 1815. He remained with them until just before the Battle of Waterloo when he was transferred to Gardiner’s Troop Royal Horse Artillery, with which he fought at the battle. He is therefore an invaluable witness to the actions of this troop during the battle which initially stood on the extreme left wing of the army but later moved to the centre with Vivians and Vandeleurs cavalry brigades, and fully supported the final allied advance. He was wounded at the battle. William does not appear to have been a verbose person, and he did not maintain his journal religiously, but simply records significant movements or occurrences, but when he does bother to record events, he does so enthusiastically and therefore provides a great deal of valuable information to those interested in the military during the Napoleonic wars, but particularly for those interested in the artillery. William Ingilby’s progression after the war was slow, but he did reach nearly to the pinnacle of his profession by the end of his life.